"GREENSBORO, NC (June 29, 2016) – Members of the public are asked to help the Greensboro Police Department name its new bloodhound puppy. The newest recruit will be trained to search for missing persons and track suspected criminals. Votes can be cast on line at https://www.surveymonkey.com/r/GPDBloodhound, or in person at GPD’s tent downtown during the ‘Fun Fourth’ event. The new puppy and her handler, Officer Kenny Jones, will be at the tent to meet the public from 2 – 5 pm. Votes will be tallied on July 8. “I am excited to bring this new hound in to our K9 team,” said Jones. “When she is fully trained, she will be able to help people who cannot help themselves – such as elderly people who may be in distress, or lost children.” Jones and his dog will train, work, and live together for years to come. The department’s K9 handlers have selected four possible names for the female puppy. The names are in honor of women who have blazed trails in law enforcement history. · "Izzy", after Isabella Goodwin, the first female police detective in 1912. She spent years working long hours as a police matron, however, her fearlessness in the face of danger and penchant for undercover work helped solve the most outrageous and brutal bank heist of the time, earning her a promotion to police detective. · "Georgie" after Georgia Ann Robinson, the first African-American female police officer in 1916. She was an active volunteer in several community organizations around Los Angeles prior to being approached by an LAPD recruiter about joining the agency. She accepted the position as a jail matron and eventually began working juvenile and homicide cases. · "Ally" after Alice Stebbins-Wells who is considered to be one of the first female police officers in the United States. She petitioned her city government for the opportunity to become a police officer in order to help women and children victims of crime. Wells was hired by LAPD in 1910, and assigned as a juvenile officer. The publicity surrounding her hiring paved the way for many other cities to hire female police officers. · "Sully" after Mary Sullivan, the first female homicide detective in 1918. She went undercover regularly for the homicide squad, and even spent weeks in the Harlem Prison in the guise of a prisoner to crack a murder case. In 1926, she became the first Director of Policewomen in the nation. She abolished the title "police matron" for female police officers, and ensured female law enforcement officers would receive the same pay as patrolmen. 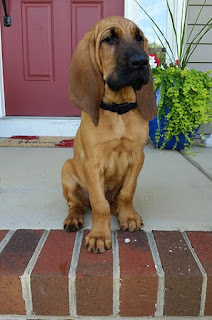 The nine-week-old purebred bloodhound puppy was donated to GPD earlier in the week by Officer Tammy Bybee, a patrol officer with the Duck, NC Police Department. The pup’s handler and trainer, Officer Kenny Jones, is an 18 year veteran of GPD who has been handling K9 since 2010."